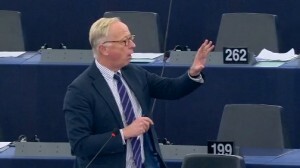 “Madam President, when our own mini-Trump, Mr Farage, claims here in this plenary that the European Union is bullying the United Kingdom, it is his way of informing us that he now understands the consequences of Brexit. He understands that when you are leaving the internal market, you’re leaving it. When you are leaving the common legislation, you are leaving it. When you are leaving the cooperation for security, you are leaving it. I must say it doesn’t take a mathematician to understand the consequences of that. But he now understands and he now blames the European Union for his propaganda. That is as Trump as you can get.